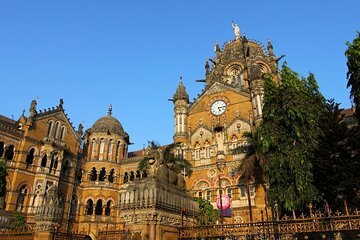 Fuggi dalle folle di turisti e goditi un'autentica esperienza locale a Mumbai (Bombay) in questo 2,5 ore. Viaggia in treno, autobus e taxi mentre salti tra i quartieri della città e goditi la vista del Chhatrapati Shivaji Terminus, patrimonio dell'UNESCO, famoso nel film "The Millionaire". Dai un'occhiata alla vita tradizionale di Dhobi Ghat, ammira le variopinte fioriture al mercato dei fiori di Dadar e curiosare tra le bancarelle del Chor Bazaar o Nul Bazaar. Questo tour per piccoli gruppi ha un massimo di sette persone per un'esperienza personalizzata. Oh yes. We had watched TV in England about the Mumbai railways, and the phenonenom of 'super dense crush load', and we saw it in action. Trains arrived, releasing a sea of humanity, but we were safely watching, up on a walkway. We travelled on several trains, a bus, and several taxis, on our way to see various classic Mumbai sights. We had two guides, with one always riding shotgun, making sure we didn't get lost. Very well organised, and it did exactly what we wanted. I was sick that day and couldn't go, but my partner had a great time and got some good photos out of it. Fantastic tour and a great way to see this city. Tour guides were really good and very informative. We were 1 hour late getting off our cruise and the guide waited for us and we caught up with the rest of the tour. What an amazing time we had. It was like meeting a friend and being shown the sights of Mumbai. Bipin was just lovely, patient and extremely knowledgeable, we felt so special in his care, It is a must do experience, we loved it. Do not miss this trip. An absolute essential introduction to Mumbai for anyone who wants to understand the basics of how the city works. Our guide Bipin, looked after us as if we were long lost friends. This must be the cheapest and most educative tour available. This trip set us up virtually straight off the plane to enjoy moving around using public transport with ease and confidence. Great guides. Excellent value. Fantastic tour, just what we wanted. Our guide, Bipin Kumar, really could not do enough to ensure we had a memorable time. This tour gave us a real insight into working Mumbai. Really liked our guide Bibin?, who showed us how to travel around Mumbai using all the different modes of transportation available. This was really empowering later during our stay, when we dared take a train trip by ourselves and lived to tell about it! Plus, we got to see some cool areas we wouldn't have gone to on our own. Well worth it!